Exterior body is constructed of 18-gauge stainless steel side panels and 14-gauge galvanized bottom. All exterior side panels are reinforced with overlapping corners and are welded in place. All body cutouts are reinforced with 14-gauge galvanized channel supports. Interior Lining at the cashier’s end is 18-gauge stainless steel, with a stainless steel bottom shelf. 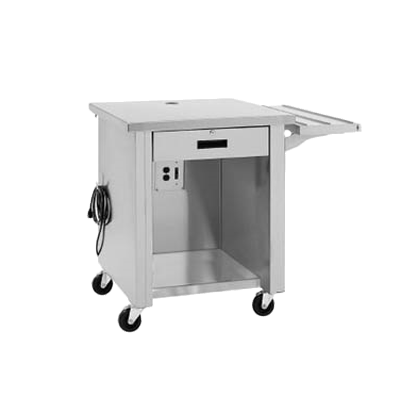 Unit has an 16.50” x 16.50” x 5.00” (42cm x 42cm x 13cm) stainless steel cash drawer with lock and key. Exterior top is constructed of 14-gauge stainless steel, welded, ground and polished into one integral unit. Top is fabricated with square exterior corners. A 2.00” (5cm) ferruled hole is located at the rear of the top to allow cord access for cash registers. Casters; unit is mounted on 5.00” (13cm) diameter swivel casters with non-marking polyolefin tires and plate brakes. Overall height of caster assembly is 6.00” (15cm).